We rightly celebrate Easter as the day that changed history, the essential foundation of faith for two billion Christians. In the apostle Paul’s words, “And if Christ has not been raised, our preaching is useless and so is your faith.” As I read through the accounts, however, I am struck by their understated nature, so different from Jesus’ birth story which had a bright star, angelic choruses, and foreign dignitaries bearing gifts. The resurrected Jesus showed up in the most ordinary circumstances: a private dinner, two men walking along a road, a woman weeping in a garden, some fishermen working a lake. A ‘superhero’ would have dazzled the crowds with a showy miracle, or swaggered onto Pilate’s porch on Monday morning to announce, “I’m back!” Jesus’ appearances show a different pattern: he mostly visited small clusters of people in a remote area or closed room. Although these appearances bolstered the faith of those who already followed him, there are no reports of Jesus appearing to unbelievers. The appearances have a whimsical, even playful quality. Jesus seems to enjoy going incognito, and passing through locked doors as a surprise guest. He toys with the downcast Emmaus disciples, first feigning ignorance about the events in Jerusalem and then enlightening them. He changes plans in order to spend the night, although as soon as they recognize him, he vanishes. Now you see Jesus, now you don’t. The last chapter of John’s Gospel records the most detailed account of a resurrection appearance. The eleven remaining disciples have already encountered Jesus, already absorbed the inconceivable fact that he has returned from the grave. Even so, seven of them have left Jerusalem and made the seventy-five mile journey to Galilee, apparently to resume their careers as fishermen. At first they fail to recognize the stranger on the shore calling out to them. Who does he think he is, giving fishing advice to the pros? They follow the prompting anyway, and Jesus performs his only post-resurrection miracle. The very ordinariness of the resurrection appearances makes them all the more believable. In one sense Easter changed everything; in another sense life went on as before, even for the first witnesses. In Jesus’ resurrection they had a glimpse of the new reality, an advance clue to God’s restoration plans for a broken world. In the meantime they felt abandoned and confused, their leader more absent than present. Yes, Easter changed history, though not in the way we might long for. This morning’s news is reporting yet another terrorist attack. Yesterday I learned that a friend died of a tumor that had grown inside his skull for twenty years. I prayed through a list of three other friends who have brain tumors, and a long list of those battling cancer; today I will pray for friends whose marriages hang by a thread, and tomorrow for parents who feel helpless as they watch their kids self-destruct. Much as the disciples experienced with Jesus, sometimes we sense God’s close presence, and sometimes not. Occasionally we, too, feel like giving up and resuming our old, familiar lives. Perhaps Jesus rationed out his appearances to help prepare his followers for what awaits them. 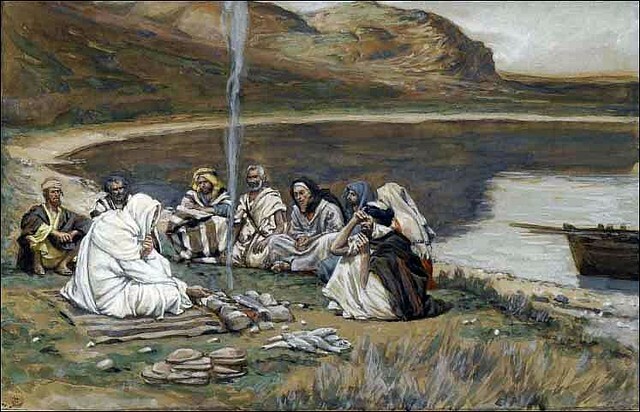 As the disciples sit bewildered around the breakfast fire, Jesus reminds them that the kingdom he has set in motion cannot be stopped— neither by his death nor by their own. The gates of hell will not prevail against the church he is leaving behind. Much had not changed on that first Easter: Rome still occupies Palestine, religious authorities still have a bounty on the disciples’ heads, death and evil still reign outside. Gradually, however, the shock of recognition gives way to a long slow undertow of hope. The disciples’ transformation occurs at Pentecost, a few weeks later. At that event the “Spirit of Christ” descends on them and a new awareness dawns. Jesus has not left them after all. He’s loose, he’s out there, he lives on in them and in all who comprise “the Body of Christ.” Including you and me. Easter puts Jesus’ life in a whole new light. Apart from Easter I would think it a tragedy that Jesus died young after a few brief years of ministry. What a waste for him to leave so soon, having affected so few in such a small corner of the world. Yet, viewing that same life through the lens of Easter, I see that was Jesus’ plan all along. He stayed just long enough to gather around him followers who could carry the message to others. Killing Jesus, says Walter Wink, was like trying to destroy a dandelion seed-head by blowing on it. Jesus left few traces of himself on Earth. He did not marry, settle down, and begin a dynasty. He wrote no books or even pamphlets, left no home or possessions to enshrine in a museum. We would, in fact, know nothing about him except for the traces he left in human beings. That was his design. Like the disciples, I never know where Jesus might turn up, how he might speak to me, what he might ask of me. Easter set Jesus loose—in us. Matthew 28:8-9a — The women hurried away from the tomb, afraid yet filled with joy, and ran to tell his disciples. Suddenly Jesus met them. “Greetings,” he said. I Corinthians 15:1-8 — …I want to remind you of the gospel I preached to you, which you received and on which you have taken your stand. By this gospel you are saved,if you hold firmly to the word I preached to you. Otherwise, you have believed in vain. For what I received I passed on to you as of first importance: that Christ died for our sins according to the Scriptures, that he was buried, that he was raised on the third day according to the Scriptures, and that he appeared to Cephas, and then to the Twelve. After that, he appeared to more than five hundred of the brothers and sisters at the same time, most of whom are still living, though some have fallen asleep. Then he appeared to James, then to all the apostles, and last of all he appeared to me also, as to one abnormally born. Lord, the sea is so wide and my boat is so small. Be with me.